THE ACTIVE DISKS PAGE HAS MOVED. PLEASE UPDATE YOUR BOOKMARKS. iF YOU ARE NOT REDIRECTED IN A FEW SECONDS, PLEASE CLICK HERE TO GO TO OUR NEW PAGE. An important trend in the design of storage subsystems is a move toward direct network attachment and increased intelligence at storage devices. Network-attached storage offers the opportunity to offload file system and storage management functionality from dedicated server machines and execute many requests directly at storage devices without server intervention. Raising the level of the storage interface above the simple linear address space of SCSI allows more efficient operation at the device and promises more scalable subsystems. This work takes this interface one step further and suggests that allowing application-specific code to be executed at storage devices on behalf of clients/servers can make more effective use of device, client and interconnection resources and considerably improve application I/O performance. Remote execution of code directly at storage devices allows filter operations to be performed close to the data; allows optimization of timing-sensitive transfers by taking advantage of application-specific knowledge at the storage device; allows management functions to be customized and updated without requiring firmware upgrades; and makes possible complex or specialized operations than a general-purpose storage interface would normally support. The processing power available on disk drives is rapidly increasing. Modern SCSI disks contain microprocessors that are only three or four generations behind top-of-the-line host processors. A high-end drive available from Quantum today is driven by a 25 MHz Motorola 68020 along with a single specialized chip for handling SCSI, servo, and disk functions. Improvements in chip technology make it conceivable to include an integrated 100 MHz RISC core in the same die space as the current ASIC and still leave room for the additional cryptographic and network processing required by network-attached disks. The graphic below shows how the electronics of the drive on the left have shrunk into a single ASIC that includes all the basic drive functions. By moving from the current 0.68 micron to a 0.35 micron silicon process, we free up die area for additional networking and security functions and make room for an embedded 200 MHz StrongARM to replace the microcontroller in the original drive. All drive control is now combined into a single chip with a significant amount of additional computing power. 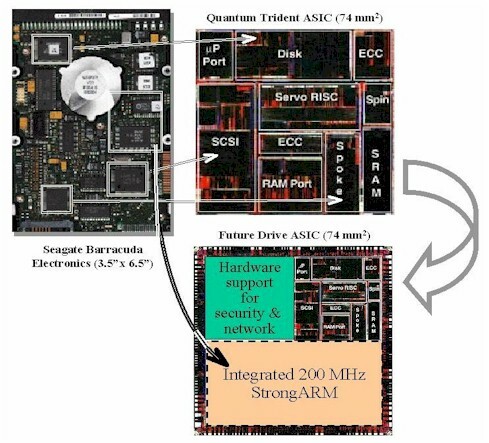 This diagram was created by photo-reducing an image of the existing Trident ASIC, but chips similar to the one shown have been announced by Siemens (Tri-Core - 100 MHz RISC core, up to 2 MB of memory, up to 500 MIPS within 2 years), Cirrus Logic (3CI - ARM7 core, moving to 200 MHz ARM9 core in the second generation), and Texas Instruments (C27x - 150 MIPS in the first generation, 16 MB address space). This microprocessor is not involved in the balance of the fastpath processing on the drive and will have cycles to spare in normal operation. We propose Active Disks as a way to take advantage of these cycles to provide value-added processing directly at disks. Active Disks allow application-specific code to execute inside the disk in order to reduce load on the network, offload processing currently done by clients/servers, and enable novel functions that can take advantage of closer knowledge of the disks' internal state than a general storage interface can provide. With drive media rates at 20 MB/s today (e.g. Seagate's Cheetah) and expected to reach 30 MB/s by the end of the decade, the limiting factor in disk I/O will no longer be the drive mechanics, but the network latency to access the devices and the processing required at clients/servers to manage the I/O. Processing that can be performed cheaply at the disks will offload the other system components and can significantly improve overall user-visible performance. The table above shows that even with relatively low-powered processors (assuming the 25 MHz microprocessors already in drives today) and low drive bandwidths (a modest 10 MB/s) the aggregate processing power available on the disks attached to most large database servers already exceeds that of the server CPUs. Even more importantly, the I/O backplanes of these machines cannot keep up with the total throughput available from the storage devices. Allowing processing directly at disks greatly increases total computational power and allows application-level throughput at the level of what the storage devices can provide. The most promising candidate applications for Active Disks will be able to leverage the parallelism in highly concurrent workloads by striping across a large number of drives. The ability to leverage the processing power of tens or 100s of disks can more than compensate for the lower relative MIPS of single drives compared to host processors. On-drive computations should be localized to small amounts of data, essentially performing a small amount of processing as data streams past from the disk media on its way to the network. Remote functions should have small code/cycle footprint per byte processed in order to keep data moving at near media rates and allow scheduling of remote computation with normal drive activity. The ability to access internal drive state and take advantage of on-drive scheduling mechanisms enables a range of storage management and real time functions that are not possible with today's interfaces. each of which take advantage of a different set of on-drive features. We have experimented with a number of applications in data mining and multimedia that could benefit from an Active Disk architecture. The first application we looked at is association rule discovery in point-of-sale data. The purpose of the application is to extract rules of the form if a customer purchases item A and B, then they are also likely to purchase item X which can be used for store layout or inventory decisions. The computation is done in several passes, first determining the items that occur most often in the transactions (the 1-itemsets) and then using this information to generate pairs of items that occur often (2-itemsets) and larger groupings (k-itemsets). For the Active Disks system, the counting portion of each phase is performed directly at the drives. The server produces the list of candidate k-itemsets and provides this list to each of the disks. Each disk counts its portion of the transactions locally, and returns these counts to the server. The server then combines these counts and produces a list of candidate (k+1)-itemsets which are sent back to the disks. This application reduces an arbitrarily large number of transactions in a database into a single, variably-sized set of summary statistics - the itemset counts - that can be used to determine relationships in the data. The chart shows the comparison between an Active Disks system and a traditional server system. The chart on the left provides measurements of a single AlphaServer 500 system with up to 10 direct-attached SCSI disks against the same server with 10 prototype Active Disks, each one a six-year old workstation. We see that the traditional server beats a system with only one or two Active Disks because the 500 MHz processor on the server is more powerful than the 133 MHz processors in the Active Disks. 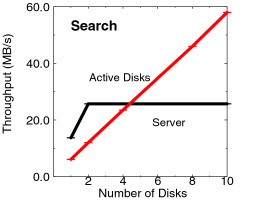 Once the number of disks exceeds four, the Active Disk system continues to scale while the server CPU bottlenecks. Our prototype is limited to ten Active Disks, but the chart on the right shows that in a system with 60 or 100 disks (as in all of the database servers in the table above) the Active Disk system is 10x and 20x faster. Our second application is an implementation of nearest- neighbor search in a high- dimensionality database. We determine the k items in a database of loan records that are closest to a particular input item. For the Active Disk system, all the comparisons are done directly at the drives. The server sends the target record to each of the disks which determine the k closest records in their portions of the database. These lists are then combined to determine the overall closest records. Again, we see the traditional server bottleneck at a low number of disks while the Active Disk system continues to scale to more than 2x faster with only 10 disks. For high- dimensionality data, traditional indices lose much of their effectiveness and brute forcesequential scanning, which Active Disks are particularly good at, is competitive with more complex methods using high-dimensional indices. For image processing, we looked at an application that detects edges in a set of grayscale images. We use real images from IBM Almaden's CattleCam and attempt to detect cows in the landscape above San Jose. The application processes a set of 256 KB images and returns only the edges found in the data using a fixed 37 pixel mask. The intent is to model a class of image processing applications where only a particular set of features (e.g. the edges) in an image are important, rather than the entire image. This includes tracking, feature extraction, and positioning applications that operate on only a small subset of the original images data. This application is significantly more computation-intensive than the comparisons and counting of the data mining applications. Using the Active Disks system, edge detection for each image is performed directly at the drives and only the edges are returned to the server. A request for the raw image at the left returns only the data on the right, which can be represented much more compactly. Our second image processing application performs the image registration portion of the processing of an MRI brain scan analysis. Image registration determines the set of parameters necessary to register (rotate and translate) an image with respect to a reference image in order to compensate for movement of the subject during scanning. The application processes a set of images and returns the registration parameters for each image. This application is the most computationally intensive of the ones studied because the algorithm includes two FFT computations. For the Active Disks system, this application operates similarly to the edge detection. The reference image is provided to all the drives and the registration for each image is calculated directly at the drives with only the final parameters returned to the server. The scaling is as before, with the server becoming bottlenecked after about four disks, while the Active Disk system continues to scale. We also see that the image processing applications are much more computationally intensive than the data mining applications, achieving only 4.5 MB/s and 650 KB/s of aggregate throughput with ten Active Disks. This is far below the aggregate bandwidth possible from the media, but the computation power of the Active Disks still moves it ahead of the server by a margin of more than 2x. The existence of an execution environment at the drive makes it possible to provide management functions that are either more complex than drive firmware would normally allow or that are customized to the environment in which the drive is installed. For example, a backup function that took into account the configuration and workload patterns of a specific environment might be more efficient than a function provided in the drive firmware that had to support all possible environments and requirements. Having such management functions operate as remote programs also allows them to be updated to extended without rewriting the entire drive firmware. Possible management functions include backup; layout optimization based on filesystem- or application- specific knowledge, or on usage patterns observed at the drive; defragmentation; and reconfiguration. As the use of multimedia becomes more widespread, there are a number of applications that require strict performance guarantees from storage systems. In existing systems, the accepted way to guarantee bandwidth is by having significant over-capacity in the system to ensure that peak requirements can be met. Applications which have soft real-time requirements, such as a streaming video display seeking to minimize jitter, require that specific deadlines be met, but also have properties that allow some flexibility. For example, an MPEG compressed movie has variable bandwidth requirements (due to non-uniform compression) which must usually be specified at the maximum rate to ensure delivery. It is also possible to drop frames - particularly I and B intermediate frames without affecting the display quality, as long as enough frames get through. Active Disks allow a video application to take advantage of these properties to schedule its use of storage and smooth its requirements, thereby allowing more efficient use of resources. Specialized functions that require specific semantics not normally provided by drives can be provided by remote functions on Active Disks. This allows functionality specialized to a particular environment or usage pattern to be executed where the semantics are most efficiently implemented, rather than requiring additional overhead in the higher levels of the system. Examples include a READ/MODIFY/WRITE operation or an atomic CREATE that would both create a new file object and update the corresponding directory object, for optimization of higher-level filesystems such as NFS on NASD [Gibson97a] . One of the important questions for a remote execution system is what programming model is provided for user-defined functions. A well-defined and limited set of interfaces such as those provided by packet filters or SQL allow control over the safety and (to some extent) the efficiency of user-provided functions, but also limit the richness of functions that can be implemented. Providing a type-safe programming language and depending on a combination of compile-time and run-time checks provides greater flexibility, but requires careful design of the system interfaces allowed to user-defined functions to prevent holes in the safety mechanism [McGraw97] and may put a significant cost on the run-time system (e.g. Java ). Object-level editing allows the insertion of run-time safety checks into compiled programs from any source language, but imposes a translation cost, a possibly significant run-time cost and again requires very careful design of the system interfaces [Lucco93, Software Fault Isolation]. A system such as proof-carrying code moves the burden of ensuring safety from the run-time system to the code producer [Necula96] , but may limit the complexity of the programs that can be expressed. Our work on Active Disks builds on our previous work in Network-Attached Secure Disks (NASD) which proposes making disks first-class citizens on the general-purpose network [Gibson97] and raising the storage interface above the simple block-level protocol of SCSI [Gibson97a] . Both the object oriented (rather than block oriented) interface to storage and the security system of NASD provide a solid base for Active Disk functions. These allow access and control at a coarse enough granularity that drives and on-drive functions can operate relatively autonomously, while retaining control and basic policy decisions in a central set of file managers. Beyond this basic interface, there are a there are a number of functions that make Active Disks more powerful and flexible. These must include this basic filesystem API, as provided to regular clients, as well as a form of input/output with the host application. More advanced functions might benefit from asynchronous callbacks with the host, some form of long-term state at the drive, the ability to specify processing deadlines, including perhaps real-time guarantees, and admission control to manage drive functions. In order to take full advantage of optimizations at the drive, the ability for remote functions to inquire about the state of the cache and block layout, and to control caching and layout through a local interface would all be beneficial. Finally, some applications (storage management in particular) might desire the capability to open communication with 3rd parties (e.g. a tape device). The relative costs and benefits of these different functions are a central open issue in the design of an Active Disk environment. Active Disks for Large-Scale Data Processing. IEEE Computer , June 2001. Active Disk Architecture for Databases. Technical Report CMU-CS-00-145, May 2000. Data Mining on an OLTP System (Nearly) for Free. Proceedings of the 2000 ACM SIGMOD International Conference on Management of Data , Dallas, TX, May 2000. Supercedes CMU SCS Technical Report CMU-CS-01-151. Active Disks - Remote Execution for Network-Attached Storage. Technical Report CMU-CS-99-177 , Doctoral Dissertation. Pittsburgh, PA, November 1999. Active Storage For Large-Scale Data Mining and Multimedia. Proceedings of the 24th International Conference on Very Large Databases (VLDB '98) , New York, NY, August 1998. Active Disks: Remote Execution for Network-Attached Storage. CMU-CS-97-198 , December 1997. "Active Disks For Databases," NSIC/NASD Workshop on Network Storage for Databases: Asset, Apathy, or Albatross? , Millbrae, CA, August 17, 1999. "Active Disks - Remote Execution for Network-Attached Storage," Systems Seminar, University of California - Berkeley , Berkeley, CA, October 8, 1998. "Active Storage For Large-Scale Data Mining and Multimedia," 24th International Conference on Very Large Databases (VLDB '98), Vision Paper, New York, NY, August 24, 1998. "Active Disks For Large-Scale Data Mining and Multimedia," NSIC/NASD Workshop: What is to be done with lots more computing inside storage? , Oakland, CA, June 8, 1998. "Active Disks For Large-Scale Data Mining and Multimedia," SIGMOD '98 - Data Mining and Knowledge Discovery Workshop , Seattle, WA, June 5, 1998. "Active Storage For Large-Scale Data Mining and Multimedia," Center for Automated Learning and Discovery (CALD) Seminar , Carnegie Mellon University, April 3, 1998. "Active Disks - A Case for Remote Execution in Network-Attached Storage," Parallel Data Systems Retreat , Nemacolin, PA, October 29, 1997.